Presently, Garh Mandaran is a popular picnic spot in Hooghly district (West Bengal), quite near to the sub-divisional town of Arambagh. Garh Mandaran, or simply the village of Mandaran was specially mentioned in Bankim Chandra Chattopadhyay's famous novel 'Durgeshnandini'. Well, even if you are not in a mood to arrange for a family/office picnic any soon you can still pay a visit to Garh Mandaran like we did, by planning a day trip to Kamarpukur (the holy birthplace of Shri Ramakrishna Paramahamsa) as those two places are situated hardly 6-8 kilometers away from one another. Other than the sacred Pir Saheb's Darga you'll get to see- deer, rabbits, parrots and peacocks kept in enclosures inside the fenced forest area of Garh Mandaran. Although I was a fool to miss out my camera, I was extremely lucky to catch those two peacocks on display. My mobile camera somehow managed the mess and captured few stills and videos of two fanning peacocks. 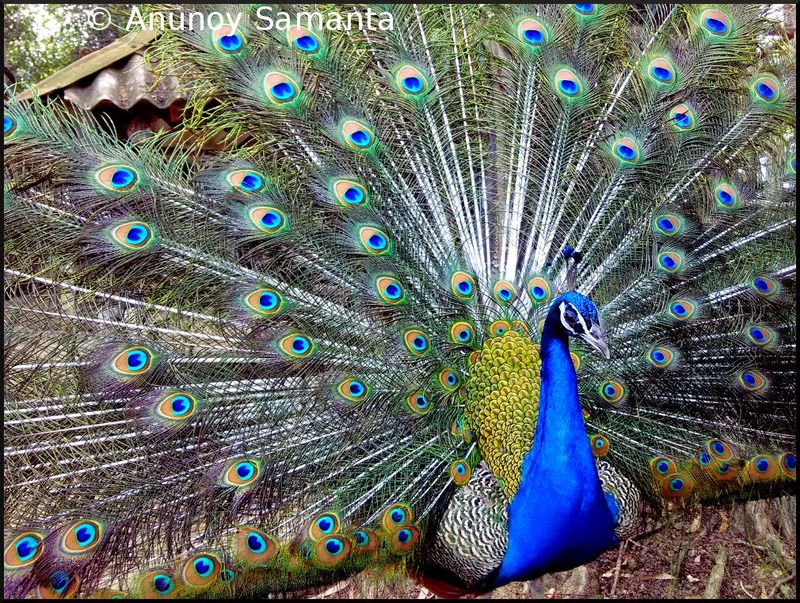 By seeing those vibrant eye-spots on a peacock's train feather any mortal would complain against the natural biasness while creating peacock! You must be knowing the reason behind fanning their feathers, right? 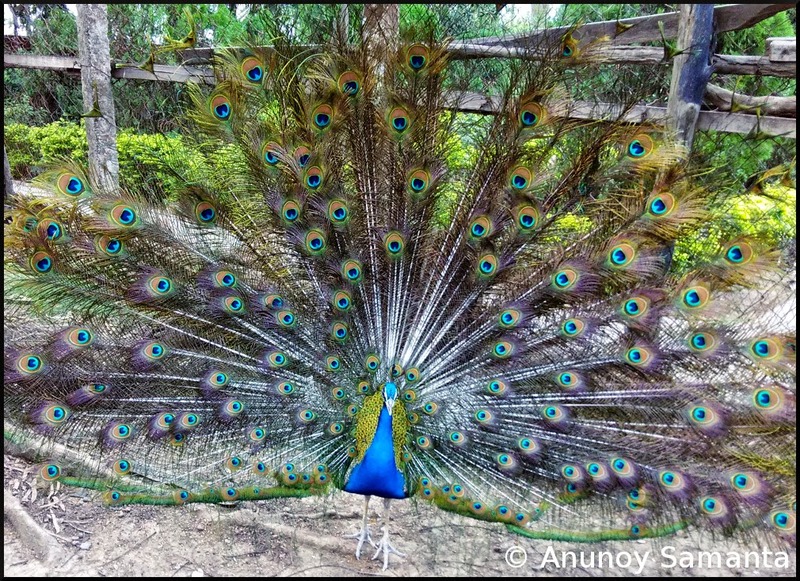 Peacocks fan out their feathers as customary courtship ritual to attract mates. Peahens get attracted to the colorful trains of Peacocks on display and select their mating partners accordingly. In one of my previous photo-posts on peacock I had mentioned that there is no color pigment contained in peacock's tail feathers, except brown and those magical green, blue, turquoise or iridescent colors you find in our national bird's plumage are due to structural coloration, a physical/optical phenomenon... isn't that amazing? 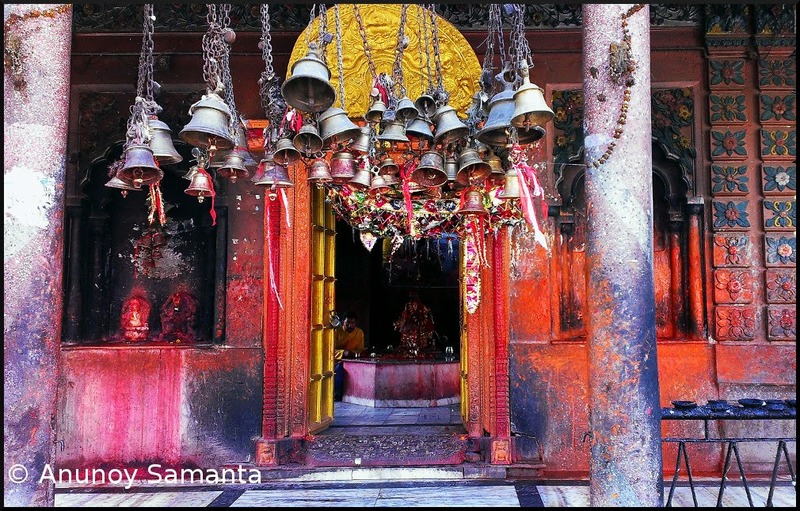 Bageshwori Temple is one of the oldest and sacred most Hindu temples of mid-western Nepal. 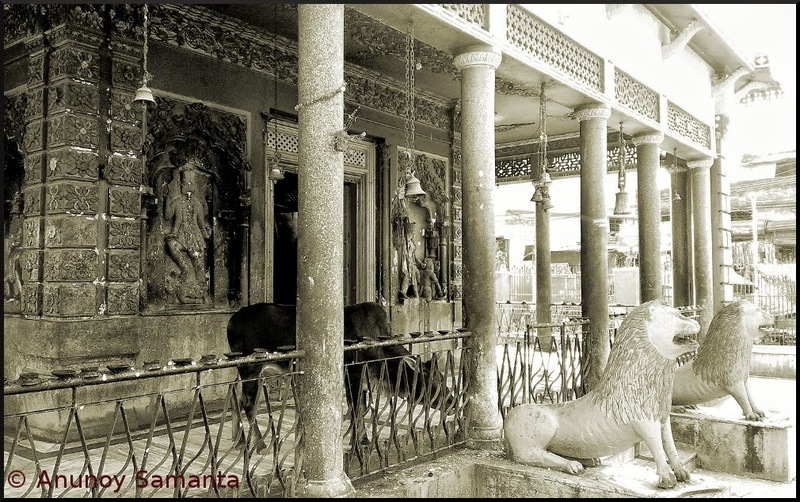 Situated at center of the dusty and congested business town of Nepalgunj, the presiding deity of this temple is Goddess Bageshwori (a form of Devi Durga). Along with the goddess this temple also houses a rare form of Lord Shiva with mustache (Junge Mahadeva) which I hadn't seen in any other temple before. On an otherwise summer noon if the vacant look of the Bageshwori Temple premises puts you in an illusion that it is just another temple, better be not deceived, because, on an auspicious day it might be so badly crowded that you may not be able to infiltrate even the nearby market area. According the the legend, when Sati immolated herself with fire, pieces of her body fell into earth and her tongue fell into the site here Bageshwori Temple stands today. Once you are in Nepal you can find the image of this popular temple imprinted on different coins! By the way, don't get fooled by fraudulent Pujaris (priests) inside the temple compound who're ever ready to tie their holy knots around your wrist. I met these parrots savoring their fruit salad inside the Padmaja Naidu Himalayan Zoological Park of Darjeeling. Parrots are not only known for their intelligence among birds but also their ability to mimic human sound! Rose-ringed Parakeet (mostly commonly seen green feathered parrot with a reddish beak as well as a ring around its neck) is probably the bird of choice for domestication in eastern part of India. Parrots have short curved and strong beaks specially adopted for breaking even the toughest seed. Anyway these parrots under zoo-arrest were lucky to have sliced fruits and vegetables for which they did not require to exert their bills. In most of the Indian Zoos you'll find birds captivated in enclosures with more than one layers of net or simply too dark to photograph. Obviously a bird's cage can not have openings large enough to put your lens inside it. So, all you can do is to keep your lens outside a hole, zoom in, focus on to your bird and expect the fence to get blurred. Most of the time your photo would come with prominent impressions of enclosure net (like you can see the hazy regions in all of these three parrot photos). But then, if good comes so easy would we be able to enjoy the fruit salad? In February I posted a couple of photos portraying post sunset glimpses of the Haldi River (Haldi, a tributary of the Hooghly River, is the center of natural recreation for visitors as well as health conscious local population of the industrial town of Haldia) where I had promised to share more riverscapes with you. So, here I'm back with the theme "River Connection". This teeny weeny river, Haldi with a span of just around twenty-four kilometers, has hardly any existence in the physical map of Bengal. Although her acquaintance doesn't extend beyond the population of this riverine semi rural petrochemical city, her significance to this region is no less remarkable! No folks, I'm not talking of its aptness as a hangout zone. The ferry service over Haldi River saves a lot of transport time and expense for daily commuters between Haldia and its nearby villages on the other bank of the river. Simple motor driven wooden boats are almost versatile to transport multiple dozen of human beings, goods, cattle, bicycles as well as motorbikes and localites are quite used to with such overloaded water transport. Sometimes I wonder, despite our growing impatience and worsening humanity, if something is hitting the positive end of the graph it has to be our adaptability! Anyway, limitlessly stretchable adaptability of human beings is beyond the scope of today's photo theme- River Connection... This reminds me that I haven't been out for photo hunt for quite a sometime and if I have to adapt to this saturated blogosphere of photo bloggers I must schedule few urgent photo walks. Take care buddies... See you soon.